Enlisted in Co.H 4th Iowa Cavalry 12-30-1863. In a battle near Tupelo, Mississippi July 15-16, 1864 he was thrown from his horse and dragged some distance. He sustained injuries but returned to duty with his unit and was discharged 8-8-1865 at Atlanta, Georgia. He returned to Iowa, married, and settled on a farm near Plymouth. In the 1860 census John is not listed with the family so he must have been working away from home. The 1870 census lists John, Mary, Yaroslav and Vratislav. Bradek apparently lived with John after their mothers death in 1867. John never recovered from his war injuries and may have needed his help. Their first farm was about a mile west of Plymouth, Iowa. In 1871 they moved to a farm about three miles north of Plymouth. John died there in 1880, at age 39. His military record states John was 5 ft 9 1/2 in tall, medium complexion, hazel eyes and brown hair. Mary Heiny must have been a remarkable woman. She was left with six children when John died. The oldest, Yarrow, was eleven in 1880. In 1884 Mary Ann died. She reared the remaining five children on their farm three miles north of Plymouth, Iowa. In 1882 she filed a claim for a widows pension on the basis of her husbands war injury. She lived her declining years with Yarrow in North Dakota. In 1916 a Veterans form states she was born at Dabonam, Bohemia 7-9-1837. She died in December 1924 near Hope, North Dakota. 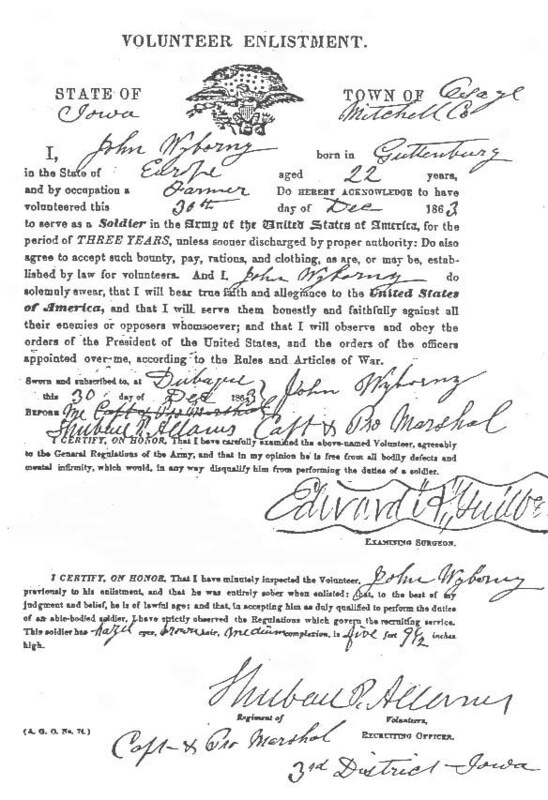 When John enlisted in the Union Army 12-30-1863 he gave his age as 22 years which indicates that he was born in 1841. His military record lists him absent from his company all of September and October, 1864. It does not say where he was or why. Company morning reports show him 3-15-1865 from duty to sick, 7-18-1865 duty to sick. Nature and duration of sickness not stated. It is probable that these absences were related to the injuries sustained previously in Misissippi.